The digital illustrations will be displayed at a public exhibition in Liverpool on Thursday (1 November) to fulfil the requirements of planning legislation. Residents who live close to the site have been sent letters inviting them to view the plans. ‘The proposed terminal has been designed to combine a high standard of civil engineering with a high quality building. Planning approval pending, the building will be constructed at Princes Half Tide Dock, which is 800 metres downriver of the current Pier Head facility. The new ferry terminal will be part of the £5 billion waterfront regeneration scheme which will see five new neighbourhoods created as part of the 60-hectare Liverpool Waters project. Vehicles and freight traffic will be served by a link road currently under construction, paid for by Liverpool City Council and the Combined Authority who have worked together to deliver funding through the major City Centre Connectivity project. 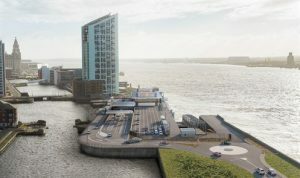 Foot passengers, meanwhile, will be able to access the terminal via a riverside footbridge, near to the planned Cruise Liner Terminal Hotel which will be located at Princes Dock. Bus and taxi facilities will be provided to the new site and will also be available across the footbridge, adjacent to Alexandra Tower as part of the Cruise Liner scheme. To view the full article including images visit www.gov.im or Click here.